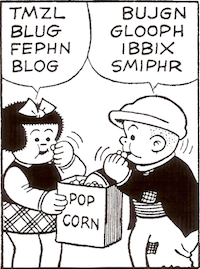 I admire this arrangement in ivory and black: the tilting balloon of "ONE GROSS," the lower-case "e's" and "l" of "Real Thin Leads," the jaunty cent sign, the chuckle-headed repetition. Real Thin Leads. 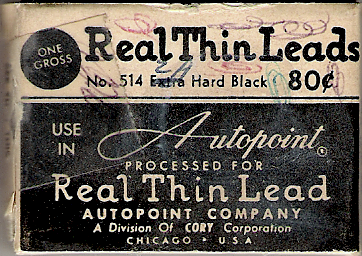 Real Thin Lead. Ask for it by names! And I admire the cursive Autopoint, the forward-looking sort of cursive one might see on a home appliance. And I like that this little package has been marked by history: at least three different writing instruments, green, red, and purple, have been tested on its surface. Just scribbles — no room to inquire Does this pen write? One side of the package has been resealed with tape in a hapless effort to honor a stern directive: "SEE THAT THIS SEAL IS NOT BROKEN." Ah, but it has been. I found these Real Thin Leads circa 1998 during a going-out-of-business sale at a downstate Illinois stationery store. The store alas had been quietly going out of business for many years before having a sale about it. ¹ In grading lead, B signifies blackness; H, hardness. 2B lead is darker than B; 2H, harder than H. HB is the familiar "No. 2 pencil." Alas, there seems to be no real standard about how hard/black HB/No. 2 is. For example, the Faber-Castell Grip B is actually about the hardness/blackness of what most think of as an HB/No. 2. And for some reason, the No. 1 Mongols I recently acquired write darker/softer than the No. 2s. * Also seen as 2-4/8, 2.5, 2-5/10. Although widely accepted, not all manufacturers follow it; for example, Faber-Castell uses a different equivalence table in its Grip 2001 pencils: 1=2B, 2=B, 2 1/2=HB, 3=H, 4=2H. Right -- these gradations are absolutely meaningful only within a single maker's line. No. 1 usually means B -- No. 1 Mongols should be darker and softer than No. 2s. I have a couple of old 2 3/8 Mongols. 2 3/8! Anything to stand out from the competition, I guess. I should not post without a license. I did not mean: "And for some reason, the No. 1 Mongols I recently acquired write darker/softer than the No. 2s." Because that's exactly what you would expect. What I really meant was, "And for some reason, the No. 2 Mongols I recently acquired write darker/softer than the No. 1s. I wonder if the the age of the pencils might have something to do with the difference in the lead. The old Mongols are to treasure, for sure, though I guess they'll never be as sought after as Blackwings. Hang on to the 2 3/8 Mongols - along with the Blaisdell Calculator and Blackwing, those were Steinbeck's favorite pencils. He specifically mentions the 2 3/8 grade in an "interview" that appeared in the Fall 1975 Paris Review (PDF). I'll bet that a Calculator is even harder to find than a Blackwing. I have some Mongol No. 2's, and can see from a statement on the box that they were made in Nos. 1, 2, 2 3/8, 3, and 4! Thanks for the Steinbeck link, Stephen. I posted it some time ago. I'm glad to see that this interview is still free; the Paris Review has pulled back from its plan to make all interviews available at no cost. I've never seen a Blaisdell Calculator. I'm glad I was able to sock away some Mongols while I could still order them from a local stationer. So happy to find this post. My dad was in the office furniture/supply business. I found a handful of mechanical pencils that use this specific lead a little while ago in my mom’s writing desk. Thanks for letting me know. I love the message-in-a-bottle feeling when someone finds a post in this way.